This entry marks a milestone in my blogging career – my one thousandth post. For bloggers who post more than once a day, it may not sound like much, but I typically post once a day (Monday through Friday). Since my first post about Smartstocks and some gadgets at Altavista way back in December of 1998, I’ve written a new blog entry almost every other day for six years. Granted, the early posts were few and far between, and in later years I’ve posted more frequently, but it has averaged out to me writing a blog entry every two days. It’s fun to look back on all the things I’ve written about. Some of the posts I liked the best received almost no response, while others that took a minute or two to write remain popular (and continue to get comments) to this day. It’s a weird phenomenon, but I enjoy it. I’ve enjoyed the discussions I’ve had with people through my blog. I’ve enjoyed researching things and having other people contribute what they know, and learning from them. I’ve enjoyed hearing about breaking news from other blogs and getting the inside scoop on things. In short, I have enjoyed the past six years of blogging, and look forward to many more years to come. I was going to search through the archives and find examples of posts that were popular, or posts that I was particularly fond of, but I’ve decided not to. I’m just going to leave it up to you. If you want to look back on the posts of the past, here are the archives. Have at’em. Congratulations, Dan. I find your posts very intersting. Six years, wow! You and ATW inspired me to start ahoyhoy.org and continue to inspire me to keep things fresh and up-to-date. Thanks, and congratulations on #1000. Congratulations on your 1000th post! How did you know this one was exactly 1000 — have you numbered each one as you went? When I/we as readers access the archives, there are number totals by month, so you’d have to add those up to see when you hit 1000. I’ve probably already read most of your posts, but I might take this opportunity to go back and read some I missed at the time. Again, congrats brother. 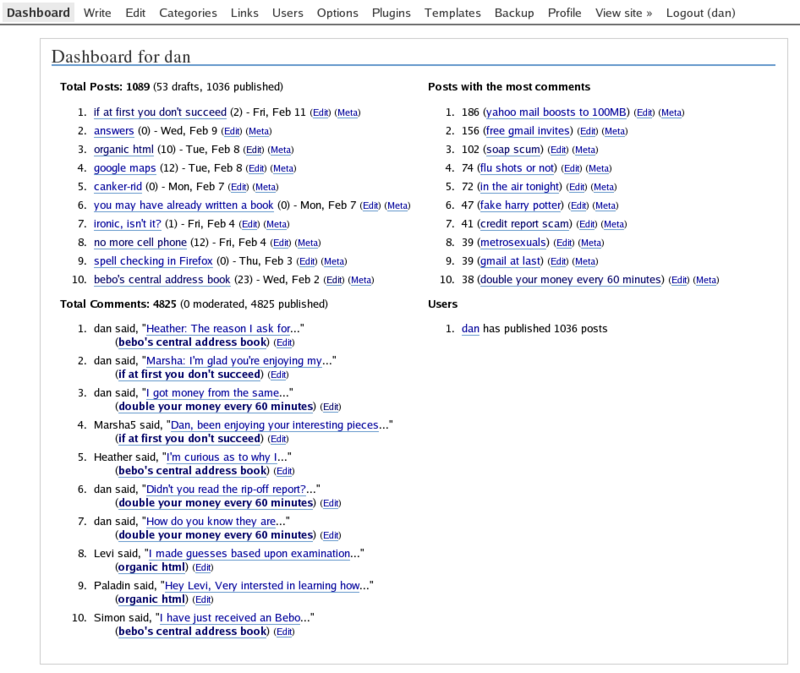 DavidH: The total post count is on on the WordPress dashboard that I wrote. Hope you reach the 2000th sooner.